If you have a Twin XL bed it can be hard to find the size you need for your essential bedding items. Some people might try and convince you that Twin sized bedding will work just fine, but don't believe them! You can find the perfect fit for your Twin XL sized bed so you'll be able to fully enjoy the comfort and style of your Twin bedding. With the added size of an extra long Twin bed, you need to make sure you choose the right Twin XL duvet cover. The standard size of a Twin extra long bed is 39" x 80", so add in a few more inches to make sure your Twin XL duvet cover or Twin XL comforter fit great without coming up short. If you found the Twin extra long duvet cover you want, we can help you fill it with ultimate comfort. If you are looking for luxurious comfort at a low price for your Twin XL size bed, look no further! Our essential Down Alternative - Ultra Cozy Duvet Insert - Twin XL (65" x 90") will add comfort to your Twin extra long bed. 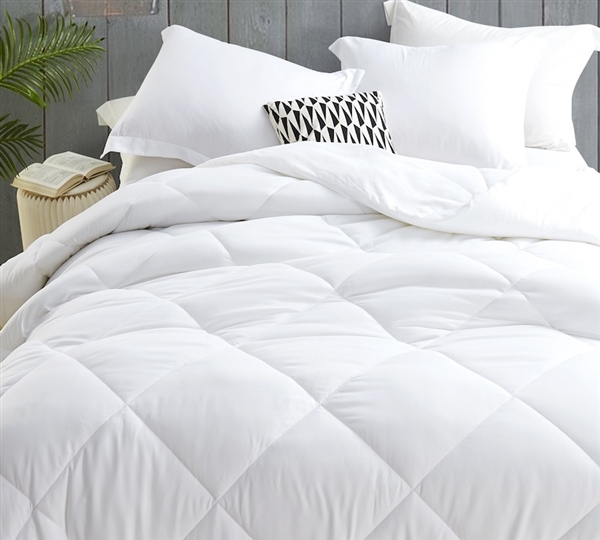 With dimensions of 65" x 90", this Twin XL comforter insert is the perfect size for an extra long Twin duvet cover, even if that Twin XL duvet cover is a few inches smaller. This cozy microfiber shell and down alternative filled Twin XL duvet insert will fill up your Twin extra long duvet cover nicely, letting you enjoy comfortable Twin XL bedding.